Well before his meteoric rise to chief justice of the United States Supreme Court, Jonathan T. Weibel was lured into the Maryland underworld under very unusual circumstances: Using highly controversial bench trials as the ingenious means, he acquitted key members of the Buchetta Crime Family of grave criminal charges in exchange for large sums of money. After his ascension to the lofty court’s bench, the greed-driven, infernal justice brazenly seizes control of the organization with the help of one of its capos, a man who, because of his prior experience as a proficient killer for hire, is ideally suited to assist the diabolical arbiter in carrying out his perfidious plans. Thus, with an able assistant by his side who specializes is physical enforcement, Chief Justice Weibel amazingly embarks on a highly secretive double life as an organized crime boss. And once his bloody usurpation is complete, he leads the crime family with cunning, ingenuity, and deadly force, taking it to greater levels of profit. However, the encroachment upon his territory by protagonist Tony Marzetta (a model father who desperately needs to raise money for his little girl’s medical crisis) not only results in a substantial profit loss but also subjects the Machiavellian justice to the dreaded possibility of public exposure. Therefore, he gives the order to have Tony killed. He miraculously survives the attack, though it tragically results in the deaths of his beloved wife and children—a heart-wrenching loss that brings him to the brink of suicide. Thrown into prison shortly thereafter for his own transgressions—and knowing who gave the order that resulted in sending his family to their graves—Tony comes to hate the insidious justice to a fathomless degree. Yet, without a shred of evidence to link him to the murders, he realizes the futility of attempting to implicate him and dedicates the remainder of his life to killing the unscrupulous arbiter for what he’s done. But the spellbinding suspense doesn’t end there. While he’s incarcerated, Tony meets two other inmates who play significant roles in the plot as well—Damon Fischer (a self-made multimillionaire) and Terrell “Champ” Davis (a former World Boxing Association champion). The three men not only become the best of friends over a period of time but also discover, to their amazement, that they each share an astounding commonality: that, even though their individual sets of circumstances are entirely different, an exceedingly wicked high-profile public official has committed an unforgivable abomination against their respective families, transgressions so heinous they’re compelled to seek them out and kill them once they’ve been released. Tony’s anathema, of course, is Chief Justice Weibel; Damon’s is a former New Jersey attorney general; and Champ’s is a U.S. senator for the state of Pennsylvania. And that’s one of the novel’s best features—readers aren’t just treated to a single dose of riveting conflict, personal atrocity, and condign retribution, but to a triple dose, all tied together in an incredible but very logical and highly realistic manner. What’s more, once the three men come to trust each other implicitly, they realize that, because their marks won’t be easily accessible targets, it’s in their best interests to work together as a team. Accordingly, they swear a solemn oath to assist one another and to take up one another’s causes should any of them fall prematurely before killing his respective mark. They also plan well for their formidable missions before they’re ever released from prison, and when they finally are, they waste no time in seeking out their targets for revenge, fully expecting to sacrifice their own lives in the process. What happens throughout the novel’s chapters is certainly the kind of stuff preeminent crime thrillers are made of (including malfeasance on an incredible scale), and its totally unexpected, twisted ending will leave you in a state of shock. 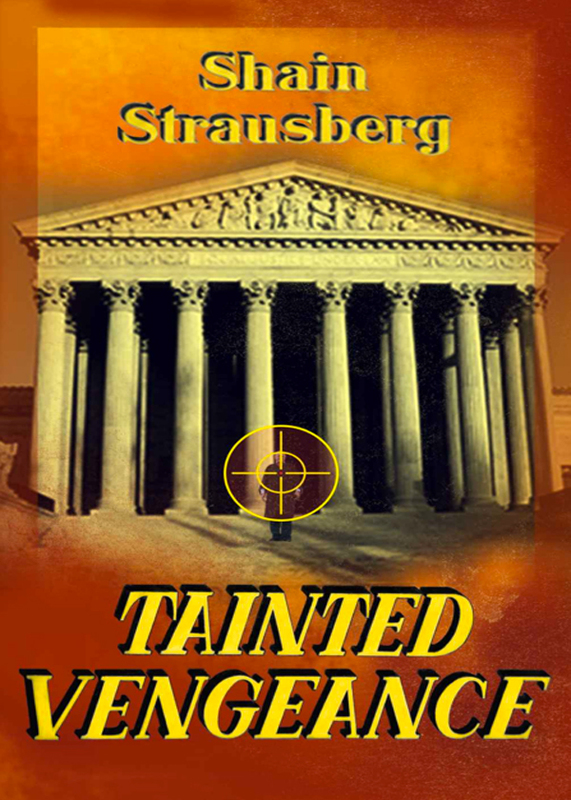 You can purchase the book online from Amazon at http://www.amazon.com/TAINTED-VENGEANCE-Shain-Strausberg-ebook/dp/B00CBLFWX6.